Inman will visit with the Lions on Tuesday, Ian Rapoport of NFL Network reports. Inman recorded 304 yards and three touchdowns on 28 receptions in nine games during 2018. Inman (shoulder/finger) does not carry an injury designation for Saturday's divisional-round playoff game against the Chiefs. Analysis: Inman was limited at practice both Wednesday and Thursday, but he'll be out there Saturday to provide Andrew Luck with a viable secondary target behind top wideout T.Y. Hilton. Over his last three outings, Inman has quietly racked up 13 catches on 15 targets for 176 yards and three scores. He'll look to extend his scoring streak to four games Saturday against a Kansas City defense that yielded an average of 273.4 passing yards per game this past season. That mark ranked 31st overall in the NFL. Inman (shoulder/finger) returned to practice Wednesday in a limited fashion, Andrew Walker of the Colts' official site reports. Analysis: It won't be known until Thursday whether Inman carries an injury designation into Saturday's divisional-round playoff game versus the Chiefs, but the expectation is that he'll be available for the 4:35 p.m. EST contest. Over his last three games, Inman has provided the Colts with a solid option pass-catching behind top wideout T.Y. Hilton, having racked up 13 catches on 15 targets for 176 yards and three scores in that span. Inman missed Tuesday's walkthrough due to shoulder and finger injuries. Inman caught all four targets for 53 yards and a touchdown in Saturday's 21-7 playoff win over the Texans. 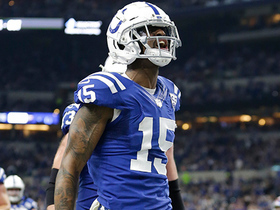 Analysis: Inman did all his damage in the first half as he caught one pass for four yards after halftime with the Colts leading 21-0 until the fourth quarter. The 29-year-old was questionable with shoulder and finger issues but didn't appear hampered during the game. Inman now has a touchdown catch in three straight games and has another solid matchup against a poor Chiefs defense next week in the divisional round. Inman (shoulder) is active for Saturday's wild-card game at Houston, Andrew Walker of the Colts' official site reports. Inman (shoulder/finger) is listed as questionable for Saturday's wild-card game against the Texans after another limited practice session Thursday. Analysis: Barring a setback of some kind, it would be a surprise if Inman is unable to suit up given the magnitude of the game on tap. 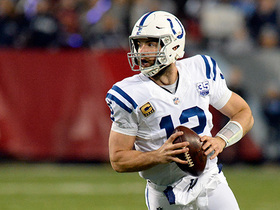 He emerged as a primary target for quarterback Andrew Luck down the stretch, hauling in nine passes for 123 yards and two touchdowns on 11 targets in the final two regular-season tilts. Inman should be a big part of the game plan against Saturday, especially if T.Y. Hilton (ankle) is still less than 100 percent as his lack of participation in practice this week suggests. Inman (shoulder/finger) was a limited practice participant Wednesday, Andrew Walker of the Colts' official site reports. Inman (shoulder/finger) is listed as a limited participant on Tuesday's estimated injury report. Analysis: Inman played through the same shoulder injury the past three weeks, including back-to-back games with a touchdown to close out the regular season. He emerged as the No. 3 option in the Indianapolis passing game during the second half of the campaign, though it's admittedly a distant third behind T.Y. Hilton (ankle) and Eric Ebron. Inman (shoulder) is listed as active for Sunday night's game against the Titans. Analysis: Inman, who caught four of his five targets for 46 yards and a touchdown in Week 16's win over the Giants, is out there if you need him Sunday night, but his fantasy upside is capped. T.Y. 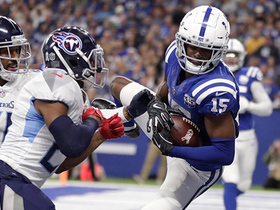 Hilton and Chester Rogers are also in Indy's wideout mix, and tight end Eric Ebron has been cleared to play in the Colts' regular-season finale. Inman (shoulder) is listed as questionable for Sunday's game against the Titans, Kevin Bowen of 1070 The Fan Indianapolis reports. Analysis: Inman graduated to a full practice session Friday, so we'd expect him to be a go Sunday. In a Week 16 win over the Giants, he caught four of his five targets for 46 yards and a touchdown. With Zach Pascal (knee) iffy for Week 17 action after missing practice Friday, Inman figures to see his share of looks against Tennessee this weekend, but his upside in that context remains modest, with T.Y. Hilton (ankle, questionable) and Chester Rogers also in Indy's wideout mix. Inman (shoulder) was a limited participant in Thursday's practice, Kevin Bowen of 1070 The Fan Indianapolis reports. Analysis: The activity amounts to a step forward for Inman, who was withheld from Wednesday's session entirely. Even if he fails to upgrade to full participation for the final practice of the week Friday, Inman seems like a good bet to suit up Sunday against the Titans with a postseason berth at stake. He's played through the shoulder issue the past two weeks, totaling four receptions for 46 yards and a touchdown on six targets over that stretch. Inman (shoulder) didn't practice Wednesday, Andrew Walker of the Colts' official site reports. 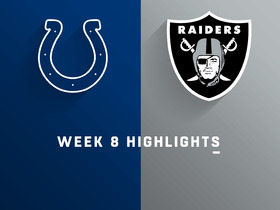 Analysis: Inman played through the same injury the past two weeks, delivering four receptions for 46 yards and a touchdown in the Colts' most recent game Sunday against the Giants. He should be fine for a winner-take-all matchup with the Titans in Week 17 for a spot in the postseason. Inman caught four of five targets for 46 yards and a touchdown in Sunday's 28-27 win over the Giants. 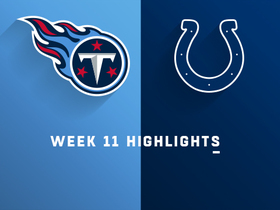 Analysis: Inman caught a two-yard pass for a score to bring the Colts within three midway through the third quarter. The game marked his second-highest yardage total of the season and his first touchdown since Week 11. The 29-year-old is not a reliable option Week 17 at Tennessee. Inman (shoulder) practiced fully Friday and doesn't carry an injury designation into Sunday's game against the Giants. Inman (shoulder) was a limited participant in Thursday's practice, Andrew Walker of the Colts' official site reports. Inman (shoulder) didn't practice Wednesday. Analysis: Inman returned from a one-game absence for Sunday's 23-0 win over Dallas, finishing without a catch on one target while playing 36 of 72 offensive snaps. He may have suffered a setback with his shoulder injury in the process, but it's also possible the Colts are just being cautious. Whatever the case, Zach Pascal seems to be pushing ahead of Inman in terms of relevance in the Indianapolis passing game as the team prepares for a Week 16 home contest against the Giants. Inman failed to catch his lone target in Sunday's 23-0 win against Dallas. Analysis: Inman played 36 of 72 offensive snaps, but the Colts were content to bleed the clock in the second half with 30 rushing attempts. The 29-year-old's snap count finished fourth among Colts wide receivers, as Zach Pascal led the group despite being targeted only twice. The game flow makes it difficult to glean too much from Sunday's outing, but T.Y. Hilton and Eric Ebron remain the only truly reliable options among the team's pass catchers. Inman (shoulder) was a full participant at practice Wednesday. Analysis: Inman should be back in the lineup for Week 15 against the Cowboys, but he may lose some of his snaps after Zach Pascal caught five of six targets for 68 yards and a touchdown in Sunday's 24-21 win over Houston. Per usual, T.Y. Hilton (ankle) and Eric Ebron are the only Indianapolis pass catchers with reliable volume, though the outlook could change if Hilton's injury turns out to be a real concern. Inman (shoulder) returned to practice Wednesday, Kevin Bowen of 1070 The Fan Indianapolis reports. 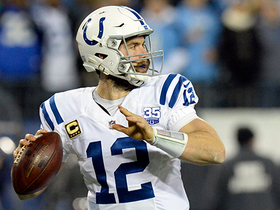 Inman (shoulder) has been ruled out for Sunday's game in Houston, Mike Chappell of Fox 59 News Indianapolis reports. Analysis: With T.Y. 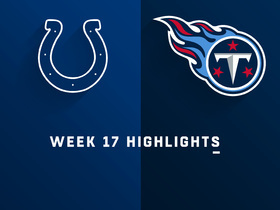 Hilton likely to be a game-time decision while nursing a shoulder injury of his own, the Colts may need some help from the likes of Ryan Grant, Zach Pascal and Chester Rogers (groin) in Week 14. The 29-year-old Inman has emerged as the team's most reliable wideout option behind Hilton, averaging 3.8 catches for 36.2 yards the past five games. Inman (shoulder) wasn't spotted at Friday's practice, Zak Keefer of The Indianapolis Star reports. Analysis: It's looking like Inman will sit out practice for the third day in a row, which certainly isn't a good sign in regards to his Week 14 availability. The Colts will reveal his official status for Sunday's matchup with the Texans when they release their final injury report later Friday. Inman (shoulder) wasn't spotted on the field for Thursday's practice, Kevin Bowen of 1070 The Fan Indianapolis reports. Inman didn't practice Wednesday due to a shoulder injury. 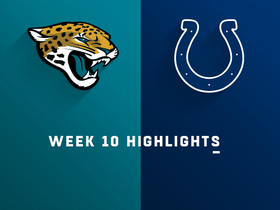 Analysis: Inman handled his usual workload in Sunday's 6-0 loss to Jacksonville, catching two of six targets for 14 yards while playing 71 percent of the Colts' offensive snaps. He's landed between four and seven targets in each of the past five games, maxing out at six catches for 52 yards during that stretch. An absence this weekend against Houston would free up snaps for some combination of Ryan Grant, Zach Pascal and Chester Rogers (groin). Inman had three receptions for 40 yards on four targets in Sunday's 27-24 win over Miami. Analysis: Inman's role in the offense continues to expand, as he played the second-most snaps (46) among the team's wide receivers in Week 12. Though his fantasy ceiling isn't especially high while working behind clear No. 1 wideout T.Y. Hilton, Inman has carved out modest utility of late with 17 receptions for 167 yards and a touchdown over his last four games. 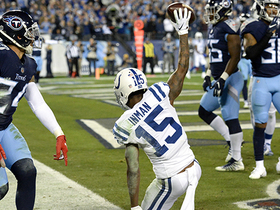 Inman caught four of six targets for 34 yards and a touchdown during Sunday's 38-10 win over the Titans. 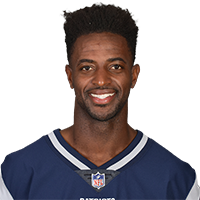 Analysis: Inman went up high in the back of the end zone for a seven-yard score late in the third quarter, holding on after a vicious hit from Titans corner Malcolm Butler. Inman, who was solid during his time with the Chargers, has looked good since signing with Indianapolis last month, with 14 catches on 17 targets in his past three games -- primarily as a possession option that possesses good size. Week 12 bring a Miami defense ranked in the middle of the league with 250 passing yards allowed per game. Inman had four receptions for 41 yards on four targets in Sunday's win over Jacksonville. Analysis: Inman came off the bench after starting the past two games with Ryan Grant out. Inman played just 18 of the offense's 55 snaps after he played 42 and 58 snaps the previous two games, so he'll see less playing time with Grant back. However, Inman still was a significant part of the offense as he was tied for second on the team in targets. Indianapolis Colts wide receiver Dontrelle Inman catches for a 2-yard touchdown. 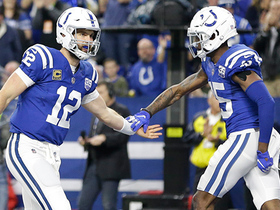 Indianapolis Colts quarterback Andrew Luck finds wide receiver Dontrelle Inman in the end zone for a 7-yard touchdown.